Fin’s Pompino (700/26) | Birmingham Hardcourt Bike Polo, UK. So I finally bit the bullet an bought a frame that was actually suitable for bike polo. My two previous incarnations were i) a brakeless hack bike from yesteryear ii) a cumbersome XL mongoose maurice, from which I transplanted most of the parts. The change has been fantastic. The large frame size is spot on with a shorter wheelbase giving me more maneuverability but still comfortable to ride for someone at 6’1” (186cm). However the biggest decision was to put a 26” wheel and fork on the front end. Dan had the same set up on his previous bike, so I knew it would work (#behindthecurve). I wanted to do it for a couple of reasons. First to steepen the headangle to get a better trail and second to push my riding position forward over a smaller wheel for better ball control with the addition of a 90mm stem (which is long by polo standards). I chose schwalbe kojak 2.0 after some advice from LFGSS forum which is grippy yet light and raises the bottom bracket just a little bit to avoid pedal strike. I’m very happy with the results and would recommend a 700/26 combo for other pompino users. It’s easy to hop around and pirouette having lost around 1kg(!) in weight but maintains good front end control. I will experiment with a few different tyre sizes up front to see how that affects control and will upgrade the brake outer to stop them bending. I hand sprayed the frame satin black to negate the contrast of bright orange wheels on a chocolate brown frame (barf). WHEELS: F – Generic 26”. R – Stock deep v 700c (hand drilled for schrader valve) 20t Dicta freewheel. 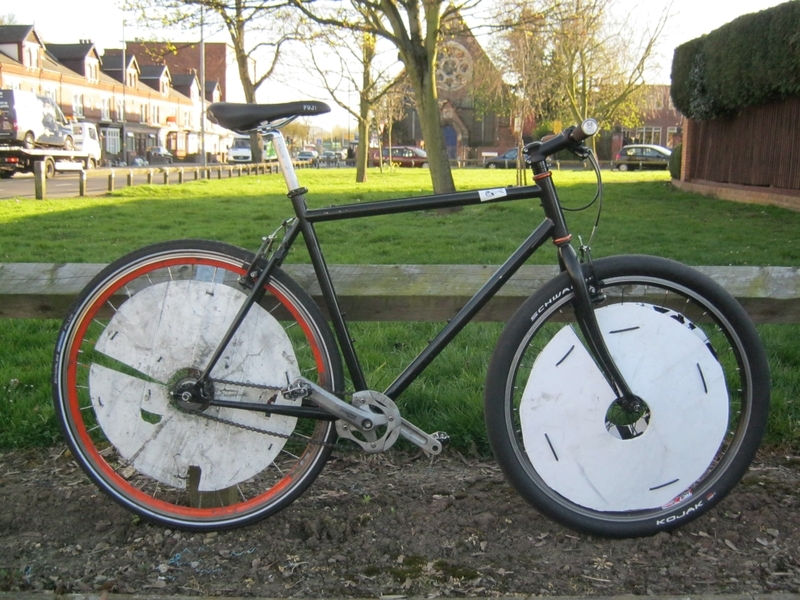 This entry was posted in Uncategorized and tagged bike, birmingham, polo, pompino. Bookmark the permalink.